Sixt makes car rental at the Orlando International Airport (MCO) easy and affordable. Available from our Orlando airport car rental fleet are high quality vehicles from some of the best car manufacturers in the world. You can choose from our premium compact cars and sedans, sports cars and convertibles, and full-size SUVs. We are pleased to announce that our branches in Orlando have been awarded the 2017 Best Car Rental Company by the Orlando Award Program for our outstanding car rental services across the city. Book online and opt for affordable extras like GPS, a child seat, or additional driver coverage. We look forward to helping you get on the road to your Orlando vacation. For an easier and more convenient car rental experience, be sure to download the Sixt App, which has been designed to add an extra layer of intuitiveness and customization. Why rent a car with Sixt at Orlando International Airport (MCO)? Our car rental services are located off site from the Orlando International Airport, easily accessible from the major roadways and with a courtesy shuttle from the airport. You can find out where the shuttle is with our live shuttle tracker. Free water will be offered on board the shuttle and at the station, so that you can refresh yourself after your long flight. Thanks to the strategic location of our station, you can easily reach the main Orlando attractions and venues in a timely manner. In fact, once you have your keys you can reach both the Downtown Orlando and Walt Disney World areas in about 20 minutes. Sixt welcomes you to our branch in Orlando International Airport (MCO)! Upon arriving to MCO, please make your way to Level 1 for ground transportation. If you arrive to Terminal A : Our pickup locations are bus stops A11-A13. If you arrive to Terminal B: Our pickup locations are bus stops B11-B13. 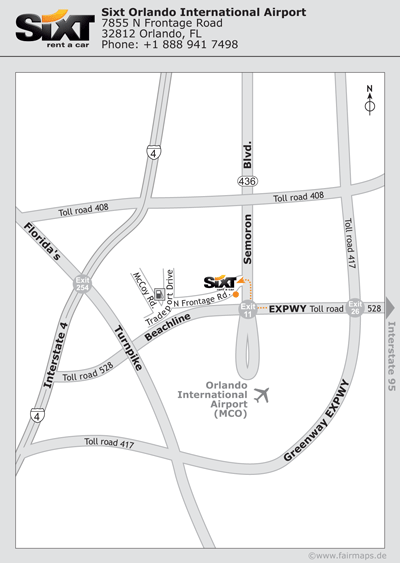 Our Sixt Orlando Airport branch is located approximately a 5 min bus ride from the airport. If you cannot find our shuttle, please use the courtesy phones located in the Baggage Claim and Ground Transportation areas and dial extension 495 for a courtesy pick up. You can also live track the shuttles: here. Take Interstate 95 to SR 528 (Beachline Expressway). Take SR 528 (Beachline Expressway) West to SR 436 (Exit 11). Take SR 436 (Semoran Blvd) North to the first stop light (there should be a TGI Fridays on the left hand side). Turn left at the stop light onto N Frontage Road. Travel 0,5 miles until you see the Sixt signs on the left-hand side of the road. Take SR 528 (Beachline Expressway) East from the Turnpike to SR 436 (Exit 11). Sixt wants to make your travels a whole lot easier with a car rental from Orlando Airport (MCO). World renowned parks are what brings most vacationers to Orlando and we have just the right transportation for easy access to all the theme parks! Walt Disney World: discover the most popular tourist attraction in the world with your car rental. Sixt offers a variety of choices including passenger van rentals to accommodate your every need. Universal Studios: make a trip to the surreal world of Hollywood movie sets and witness the props that you see every day in your favorite movies ranging from Jurassic Park® to Indiana Jones®. Sea World: seek a wet adventure with dolphins and Orcas. You can watch them breach gracefully over the water and join in on the action when they splash all over you! Wizarding World of Harry Potter®: see your favorite wizard from this beloved childhood series at the World of Harry Potter and cast some wicked spells. Have a magical time with friends and family! Take a swing at a luxury car rental to cruise on over to the Waldorf Astoria Golf Club. Choose a convertible rental and cruise to the Orlando Watersports Complex for SUP yoga, wake-boarding, jet skiing, and other summer activities! Choose Sixt for your Orlando Airport car rental and begin to create lasting memories in Orlando as soon as you hop off the plane.